Move over rover, man has a new best friend! Don’t get me wrong, dogs are awesome. I love my lab, Sophi, and there are countless team members at my company, ClickDimensions, that have even more passion and love for animals. But when it comes to ruling the house and gaining our attention, more people have allowed their smart phones into places where their pets have been told “no” – a spot at the dinner table, sitting on their lap in the car, next to them in bed, and in fact a market research study found out that 75% of Americans admit to bringing their phone into the bathroom, and 14% of them have dropped it in the toilet. The point is, phones are not just a technology accessory anymore. They act as a vital communication tool for the most significant areas of our lives, but also as a medium for pointless things like flappy bird. There is a growing movement of BYOT (bring your own technology) in businesses across the globe. This means that more and more, a person’s business phone is also their mobile phone, adding yet another dynamic to the way people use and view their mobile companion. So why would anyone want to open the floodgate and let their text messaging app get treated like their email inbox? They don’t, and they won’t. They learned the hard way with email, and like hell are they going to start handing out their mobile number and inviting the world to spam them via text messages. And because of its email predecessor, SMS marketing often gets a bad rap. There is a very fine line between useful communication and spam, and marketers are failing just as much, if not more, than they are succeeding at walking this line. The current state of text message/SMS marketing is a cup half empty or half full; you can interpret it how you see fit. With consumer platforms like WhatsApp and SnapChat, some people think that SMS/text messaging as a whole is on its way out, and SMS marketing is dying or dead. I agree that the flame has diminished in some markets. But that doesn’t mean that that there isn’t any opportunity. In fact, it means there is even more opportunity as other companies might be missing the boat or abandoning ship. The problem with SMS isn’t within the channel, delivery, or even the message in most cases; it’s because a lot of organizations have a poor text/SMS strategy. Commonly, SMS is used as another strictly outbound channel to spread word to the masses. The marketing mindset is, “we have their cell phone number, let’s send it to that too!” The problem with that mentality is that it assumes SMS is a “blasting” tool; there isn’t any concern with creating an engaging, interactive conversation with the customer. SMS itself is not the problem, rather “blasting” tools are. There are companies and organizations who have accepted the fact that blasting won’t last, but they haven’t yet seen past this one-way strategy in SMS marketing. While part of the struggle with SMS messaging is due to mindset, the other part is technology. Many SMS messaging, and even email marketing, solutions are just outbound delivery systems. When all an SMS messaging tool can really do is send texts, it’s pretty tough to create an ongoing, engaging conversation. ClickDimensions has changed that. By bringing email marketing and SMS messaging into Microsoft Dynamics CRM as native components, you can create very powerful experiences driven by logic and data that you already know about your customer. It’s as simple as configuring a listener on an inbound shortcode. When your customer or prospect messages you, perhaps with the keyword you’ve put on your flyer or jumbotron, that inbound message is stored against their contact or lead record. And because it’s CRM data, a workflow can send a reply SMS message with the coupon code or message you specify. Could you see your company facilitating a scavenger hunt at your next conference, sending new clues when people find the check points? What about sending customers coupons, that they can access from their phones while in the store, that are specific to their interests? To create an engaging SMS experience with your audience, look past SMS as a dying one-way platform. With CRM and SMS messaging together, you can create not only conversation, but also conversion. 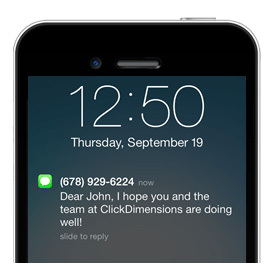 For more about using SMS in Dynamics CRM through ClickDimensions visit: www.clickdimensions.com. ClickDimensions Marketing Automation for Microsoft Dynamics CRM empowers marketers to generate and qualify high quality leads while providing sales the ability to prioritize the best leads and opportunities. Providing email marketing, web tracking, lead scoring, nurture marketing, social discovery, campaign tracking and web forms and surveys, ClickDimensions allows organizations to discover who is interested in their products, quantify their level of interest and take the appropriate actions. For more information, about ClickDimensions visit http://www.clickdimensions.com, read our blog at http://blog.clickdimensions.com or follow us on Twitter @clickdimensions or email [email protected]. 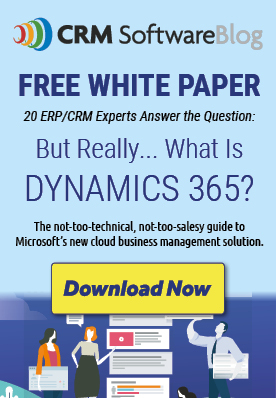 Le module Marketing de Microsoft Dynamics CRM ou Microsoft Dynamics Marketing? or blog posts in this kind of house . Exploring in Yahoo I at last stumbled upon this site. Yes that’s right that there sms marketing is not dead and still it has the effects to getting costumers for business. Also should be some limitation for text and such informative with good designs on sms marketing for attract the mobile users. Now there are many sms marketing service providers are raising as experttexting.com and etc which trends that still sms marketing is alive.